To provide more technologically advanced patient care, many rural healthcare organizations are exploring ways to tap into the power of high-speed networks. In 2007, the Federal Communications Commission (FCC) announced the formation of the Rural Health Care Pilot Program (RHCPP) designed to benefit rural healthcare providers, which serve more than 50 million individuals across the United States. The RHCPP’s goal is to enhance funding to enable rural healthcare providers to obtain and employ broadband; fund, create, and utilize broadband networks for telemedicine and telehealth; and fund a nationwide backbone dedicated to public health and safety. Such infrastructure would allow large networks to cover multiple states and connect clusters of healthcare facilities to advanced broadband, a practice that would especially assist rural hospitals located in isolated areas and those with limited access to healthcare professionals. ARRA has appropriated $7.2 billion to create a broadband infrastructure, public computer centers, and the adoption of broadband in rural areas. 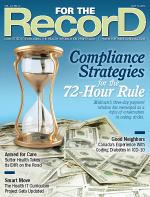 ARRA also offers incentives for HIT adoption, particularly for the conversion to EHR systems. Like all US healthcare providers that receive federal incentives, rural healthcare facilities are held to the meaningful use standards set forth in ARRA, which healthcare organizations must meet by 2015 to avoid reductions in Medicare reimbursements. Many facilities in rural areas are critical access hospitals with 25 or fewer beds that receive additional Medicare resources. For these hospitals, the mandate to move into the digital age has become all the more crucial. The NRHA has found that one problem lies with how broadband is defined. “When you have EHR, voice, data, and video over the same circuit, for example, that can far exceed anyone’s definition of broadband,” Slabach says. When the FCC was considering its 2007 policies, the National Rural Health Resource Center (NRHRC) undertook a brief assessment of broadband in rural areas. The NRHRC discovered broadband speed requirements were always more than previously considered. T1, a large copper wire that is a cost-efficient form of broadband access for rural areas, is slow by current standards. For example, telemedicine and EHR systems are unable to use a T1 connection. Most experts believe hospitals need 1-gigabit circuits to meet their technology needs. “There is a real push to build out broadband to 1 gigabit, and bandwidth needs are really driving it,” Gerrity says. Slabach agrees, pointing out that a failure to move forward could have serious consequences. “With slow network speeds, there can be problems with propagation. For instance, tele-emergency requires clear communication. Of course, we want no confusion during the care process, and we want to ensure that patients have proper access to immediate services,” he says. Funding from the FCC and individual states helps ensure hospitals have 1 gigabit available. Still, as new technology emerges, the need constantly increases, requiring high-speed networks be upgraded on an as-needed basis. “With the explosion of mobile telehealth and the use of the Internet to connect via iPhones, tablets, and iPads, everyone is scrambling for more bandwidth,” notes Dale Gibbs, director of telehealth for Catholic Health Initiatives in Nebraska. As technology increases, more T1 lines are needed, Gibbs says. In Nebraska, all hospitals have T1 lines, thanks in part to subsidies provided by Universal Service Administrative Company (USAC), which help lower the cost for individual hospitals from approximately $2,000 per month to $250 per month. Add in subsidies from the state’s Public Service Commission and the price drops to $100 per month. “For critical access hospitals that are just breaking even or even losing money, this savings is extremely important,” Gibbs says. In 2010, US Commerce Secretary Gary Locke announced 10 ARRA investments “to help bridge the technological divide, boost economic growth, create jobs, and improve education and healthcare across the country.” The investments, which totaled more than $63 million in grant support, were aimed at increasing broadband access and adoption. The Department of Commerce’s National Telecommunications and Information Administration’s Broadband Technology Opportunities Program, funded by ARRA, provided the grants for a dozen states, including rural areas of West Virginia, Arizona, New Mexico, and Utah. While funding for broadband is one of the largest obstacles for rural healthcare facilities, latency—a network’s response time to propagate, or generate, an image—has also proven to be troublesome. Ideally, options such as tele-emergency and telesurgery should take place in real time. “High-speed optical networks can support such healthcare needs,” Gerrity says. It’s a question of cost for many rural facilities, Gibbs says. “Fiber optics would be optimal, but many rural hospitals find the cost too expensive,” he notes. Another challenge facing rural hospitals is finding and retaining qualified individuals to run sophisticated IT systems. “It’s not only infrastructure that needs to be in place; we also have to have personnel who understand the technology and are well trained. That means there must be access to educational programs to help them get the proper training they need,” Gerrity says. Although rural healthcare facilities face a tough assignment when it comes to matching the resources of their urban counterparts, there are solutions available to help them achieve their goals. There’s good news on the bandwidth front, where costs, which vary by location, are dropping significantly, Gerrity says. Technology is maturing and benefiting from increasing investment, which enables costs to decline. Some hospitals are beginning to contract with service providers that offer favorable service-level agreements. In addition, many hospitals are building and managing private optical networks. State agencies are constructing these networks that must connect to community anchor institutions such as schools, universities, and healthcare providers, which in turn connect to network backbones. Gerrity cites Internet2, a consortium of research and educational institutions with a 100-gigabit-per-second backbone as an example of how technology and collaboration are helping address underserved healthcare areas and public safety. Internet2 comprises more than 350 member institutions, including leading research universities, corporations, nonprofits, and government research agencies. Already on the threshold of its fourth generation, the Internet2 network will ultimately provide 8.8 terabits of capacity, reaching into remote, underserved areas. According to its website, the consortium was created through a federal stimulus grant from the National Telecommunications and Information Administration’s Broadband Technology Opportunities Program. For awardees of the FCC grants, funding from the RHCPP could cover up to 85% of the cost of connecting to Internet2’s dedicated nationwide backbone. Last year, a massive project undertaken by the Navajo Tribal Utility Authority (NTUA) helped usher broadband into the Navajo nation when the organization received a $32.2 million ARRA grant to build a fiber and microwave infrastructure. With an overall cost of approximately $46 million, the project involved 59 microwave towers, covering 27,000 square miles. To make the process more efficient, Gerrity suggests providers combine on the network for both healthcare and administrative purposes. Gerrity and Gibbs agree that satisfying the need for broadband in rural areas can have long-lasting effects on communities searching for the level of healthcare most often associated with facilities in urban areas. US Agriculture Secretary Tom Vilsack recently announced funding for 52 distance learning and telemedicine projects that will increase access to healthcare and enhance educational opportunities in 29 states. The projects total $14 million and include 19 distance learning projects, 32 telemedicine projects, and one combined project. All will benefit rural counties. Forty-five percent of total funding will go to counties where the minority population is greater than 30%. Another 18% of this funding will benefit areas where the Native American population exceeds 30%. • Improving healthcare services for rural Virginia: A $149,094 grant to the Appalachian College of Pharmacy will enable health officials to better manage chronic disease, specifically targeting diabetes and primary health needs in the southwest corner of the state. This award will allow the College of Pharmacy to team with a rural hospital, healthcare providers, and local pharmacies to offer more efficient, consistent, and reliable delivery of healthcare for patients with chronic conditions. • Saving rural Wisconsin residents time and money: A $446,735 grant to Dean Health Systems in Madison will enable residents of seven counties in rural Wisconsin to use 12 telemedicine sites that will save nearly 13,000 hours of travel time and $302,940 in travel costs and prevent $448,272 in lost wages. The new telemedicine system will provide critical access to cardiology, pharmacy, and dermatology services. The equipment also will be used to improve the coordination of disaster responses. For a complete list of the awards, visit www.rurdev.usda.gov/supportdocuments/rdDLT2012ProjectList.pdf.